Home decoration category on Aliexpress is one of the most visited categories on Aliexpress. So it would be a shame if we just passed it without creating a blog post about some of the best home decor items on Aliexpress. As usual, we ordered loads of things (around 60) for almost 700 dollars and created this list featuring the best 20 home decor deals on Aliexpress. Some of the things are a bit fragile so we haven’t listed any things that came broken or in non-sufficient packaging. So let’s start! Hope you are going to enjoy reading and especially shopping! Let’s start with this absolutely awesome Groot pot. The main purpose is using it as a flowerpot. However, you can also place it on your desk and use it as a pencil holder. If you decide to use it as a flowerpot, then you are going to be happy about the hole it has. That means you don’t have to worry about the over-wetting of the flower. Don’t forget that you can choose from 7 Groot designs at a similar price level. If you have more flowers (or pencils, right) you can buy different ones to make your home more stylish. These sticky butterflies are the best-selling home decor item on whole Aliexpress. We actually ordered them from 4 different sellers and they all were pretty much the same just in different colors. It’s great for a children room and it’s also good for your living room or bedroom. We were scared that they are going to look cheap and it’s not going to hold on the wall but all of the butterflies we ordered were surprisingly good. You can choose from 4 designs by clicking on the picture or link below. If you are looking for some other designs we also ordered (and we recommend them to you) these gold and silver (6 designs), these colorful butterflies (10 designs) and these butterflies with LED lighting (1 design). All of them cost around the same price (with exception of LED ones – they cost 0.4$ per piece) and all of them are recommended by us! These maps are superb! It’s a pleasant surprise to find something with such an awesome quality on Aliexpress. We ordered 4 maps of different sizes (Sydney, Florence, Athens, and Moscow) and all of them were well-made without any mistakes (at least we think so, haha). You can choose from 24 city maps in 9 different sizes. We ordered the smallest one as well as the biggest one. The smallest one (13×18 cm) is a bit smaller than the A5 paper. On the other hand, the biggest one (70×100 cm) is around the size of an A0 paper. The most ordered sizes are 30×40 cm (around the size of A3 paper) and 60×80 cm (around the size of A1 paper). We actually talked about this sticker in our article about the best things from Aliexpress for Star Wars fans. Nevertheless, it feels like it fits in this post as well. You can choose from 6 colors and you can use the sticker on various light switches. It’s made of 2 parts, but you can easily cut it in more pieces to make it suitable for your light switch. By the way, you can also find a luminous sticker (with the same design) for a price of $1. However, we haven’t tried it, so we can’t guarantee it works just fine. This moon phase picture is actually one of the nicest pictures you can get from Aliexpress. It’s made out of good material and it also came well-packed. The only con we found out is it’s size. You can buy it in 7 different sizes and all of them are not really ordinary ones. So it’s not that easy to find a frame that fits it. So if you are thinking about ordering it, don’t forget to visit some shops around your home to find out if they offer a frame for it. Next product on our list is this set of three umbrella hooks. It’s a great way to decorate your home with something that’s not only nice but also useful. Also, it’s really easy to attach these umbrellas because it has a tape attached to it. Unfortunately, you can’t choose the exact colors, but you can choose from 3 mixes of colors so we hope you will find some that fit in your home. This scratch-off map is one of the best-sellers on Aliexpress. It has quickly become a hit on Aliexpress and it’s sold by hundreds of sellers. We decided to choose this one and it came well-packed and surprisingly fast. The seller is selling the scratch-off map in the picture above in 2 different sizes. The smaller one (for $4.33) is 42x30cm (the same as A3 size of paper). The bigger one (for $6.36) is 82×59 cm (similar to A1 size of paper). He is also offering 2 other designs which we haven’t tried. Also, if you are looking for a different design of the scratch-off map, take a look at this one. Okay, this one is a bit more expensive. The thing is, that we just had to put it on the list. Why? 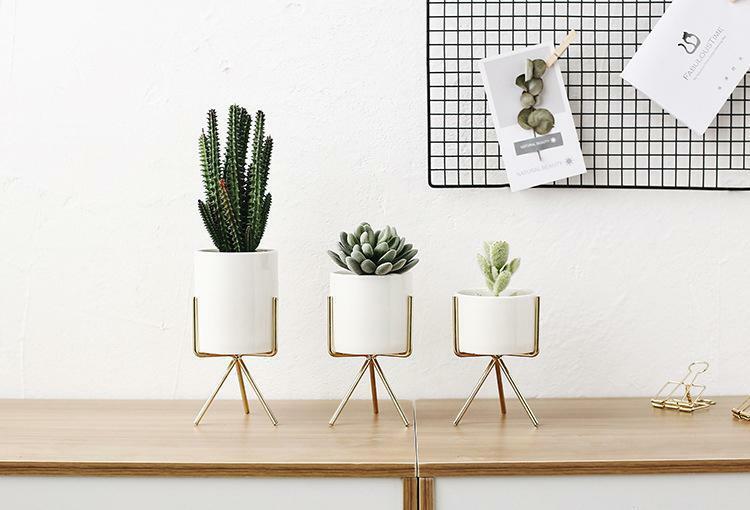 Because these planters look absolutely astonishing! First of all, the package was packed in 3 different bubble foils. And the planters were packed even more inside the box. So there was almost zero chance of it breaking. The other reason we decided to put it on the list is the quality of the planters. They are really well made and we are really happy to see some quality products on Aliexpress. So if you have some plants and you want to decorate your home, go for them! A third map on the list? Yea, don’t worry, it’s the last one. You can get this map in 4 different sizes as well as in 2 different designs. The paintings came unframed and rolled in a tube but it wasn’t expensive to get them the frame in the local shop so it looks the same as in the picture above. Yeah, we absolutely love these. It’s such a small thing that makes your home look instantly cooler. It doesn’t matter if you own a gramophone or not. It’s a great thing that will amaze your guests. You can order 2 pieces ($1.47), 4 pieces ($2.09), or 6 pieces ($2.95) and all of them will come to you in a nice little box. So if you are looking for a gift for a vinyl lover, then we have one for you. It can feel kind of weird to order a whole shelf out of Aliexpress. However, we still decided to do it and we don’t regret it! It came in 10 days and it was really well packed so there was zero chance of breaking. When we unpacked it, it looked exactly like in the pictures and the great thing about it is how easy it’s to use it. You only need one nail in the wall and that’s all. You can choose from 7 different colors so you are going to find the one you like. We ordered the white one and we can only recommend it. Let’s move into the bathroom for a second. People often forget about decorating it but you spend there few minutes each morning and evening so it’s in front of your eyes every day. If you are looking for a cheap and simple, but still very good looking decoration, you can try these bathroom sets. You have a possibility to choose from 25 designs so let’s hope you will find at least one you are going to love it. Let’s stay in the bathroom with this next product. It’s a temperature-controlled LED faucet that you can use in your bathroom as well as in your kitchen or toilet. There are many faucets on Aliexpress with a price around 2 dollars. However, we decided to order a little more expensive one with great feedbacks and reviews. And it was the right decision because unlike the others, this works great! It really changes the color and it’s bright so you can see it clearly even under the daylight. People shopping on Aliexpress really love the wall clocks. It’s one of the best-sellers not only in the home decor category but also on the whole Aliexpress. It came in a strong box so it shouldn’t break while traveling from China. It was a bit harder to put it on the wall because you have to measure it but it took like 20 minutes so you don’t have to worry. The clock itself is quiet so you don’t have to worry about the noise as well. The only thing you need is a (classic AA) battery which is not included in the package. By the way, you can choose from 8 different colors in 2 sizes. Are you a fan of Queen? Then you are probably a fan of the Freddie as well. This sticker is a really great decoration and you are going to love it! It’s easy to stick it on the wall so you don’t have to worry about damaging it. And hey, it’s less than a dollar. What else do you want? Have anyone here said sticker? This sticker is one of those things that make your home look astonishing. Your guests are going to think that you spent hundreds of dollars on a decoration while you got it for a few bucks. You can choose from 11 different colored mirrors and from 5 different sizes. The smallest one has 45×60 centimeters, while the biggest possible option is tall as a regular girl (123×165 centimeters). Don’t forget to read through the product listing where you can find out how you can stick it on the wall. We talked about these stickers in our last episode about the things from Aliexpress under 1$. But we still think it’s something that should be here too. For less than a dollar, you are going to get 36 pieces of labels that make you look like a person that has some system in their life. You know, as an adult. By the way, as we said in the other article, we recommend to order a white marker ($0.8) that makes it 10 times easier to write on the labels. You won’t believe how awesome a glow in the dark tape is. No more finding of light switches, no more tripping on stairs in the night and no more.. you know… the other things that are happening to you. The light from the tape is really bright if it manages to catch some light throughout the day. The best thing is that it can decorate your home so nicely and you can’t almost see the tape throughout the day because of its white color. Trust us and order one. You are going to love it!! This thing is pure magic! It looks breathtaking and it’s also useful. You can put it for example on your bathroom windows. You won’t get spied on by your neighbors and they will also see your spectacular windows. It’s easy to stick it on the window and it should also be easy to get it down. The size is 60×200 cm and they are unfortunately not offering any more sizes. So if your windows have some other size you are going to need to cut it or you will have to buy more of them. And the last one our list is this beautiful painting. The awesome thing about it is the fact, you can order this painting as a set of three but you can also order just one picture (for a third of the price) and it will still look wonderful. But let’s talk about the sets here. The cheapest one will cost you 7.20$ but it’s kind of small. Each of the papers has a smaller size than the A5 paper. So it’s great for example to put it above your monitor or TV. The biggest and also the most expensive one will cost you 25.98$ but it’s so worth it. The quality of the paintings is really high. And each of the paintings is a way bigger than the A2 paper. Damn, that’s all? What a shame, so many home decor products from Aliexpress we would love to write about but we had to chose just a 20 out of them. Hope you enjoyed this article. Let us know in the comment section about things you bought or just things you are missing here. Stay tuned for some new articles. The best thing you can do is give us that thumb up on our Facebook page so you know about our articles as the first one!